47″ x 78″ Retractable Banner Stand For Trade Shows. 47″ x 78″ retractable banner stand makes for a great back drop for a trade show or convention. $7″ x 78″ retractable banner stand is just that, about a 4ft wide 6 1/2 ft tall upright banner stand that can be set up and taken down in minutes to help you reinforce your verbal marketing message. 47″ x 78″ retractable banner stand comes with a carrying case that holds everything you need to set up and take down your retractable banner stand in a convenient carrying case. All the parts easily disassemble and fit into a black nylon carrying case that is lightweight and easy to carry onto airplanes and other methods of travel. You can purchase these retractable banner stands at sign shops in your area or in the Las Vegas area. Many people prefer to buy in the Las Vegas area because it is more convenient to buy them where they are going to be used. Las Vegas is the convention and trade show capital of the world because of the amount of trade shows and conventions that are held in the Las Vegas area. No matter what size convention you are planning, Las Vegas can assist you with your needs. And why not ? Las Vegas has fine dining, world class accommodations, gambling and a night life that is second to none. There is no better place to have your convention or trade show than in Las Vegas Nevada. Las Vegas 3ft x 8ft Vinyl Banners For Advertising. Las Vegas 3ft x 8ft vinyl banners are a very popular way to advertise your business and obtain new customers. Las Vegas 3ft x 8ft vinyl banners are very economical and large enough to get your business noticed. Las Vegas 3ft x 8ft vinyl banners are made with a 13 ounce banner material and printed with state of the art inks that allow the lettering not to fade for 3 plus years. These large vinyl banners are printed with large format printers that print directly on to the vinyl banner material. This printing system allows for logos and pictures to printed on the banner with excellent quality. Las Vegas 3ft 8ft vinyl banners are excellent size to hang on the outside of most business locations and can be seen from far away. They easily mount with the grommets that the banner come with. Simple screws and rope in most cases are all the necessary fastening equipment that is needed. Most always, anybody can put up these banners. It is important to remember that to make the banner last a long time, you need to mount the banner against a solid surface so that the wind does not constantly push up against the banner and cause damage to the grommets. In case the banner needs to be put up high on a building, a professional installer is recommended so that there are no mishaps. Many businesses are using these banners to advertise weekly specials and then simply rotate the banners so that there is always a new special that is being seen by potential customers. Customers always like new and exciting specials and this will keep them coming to your business. Las Vegas 3ft x 8ft vinyl banners are not expensive. They cost an average of about $2.00 a square foot and many times, sign shops will run specials on them. 33″ x 78″ Retractable Banner Stands. 33″ x 78″ Retractable Banner Stands are one of the most popular pull up banners stands. 33″ x 78″ retractable banner stands are easy to set up and take down and are very popular with trade shows and conventions. The signs are called 33″ x 78″ retractable banner stands simply because the banner is just that, measures 33″ x 78″ and inserts into a retractable banner stand. These 33″ x 78″ retractable banner stands can be full color, meaning you can have as many colors as you want on the banner. This would include logos, pictures, background wallpaper, etc. 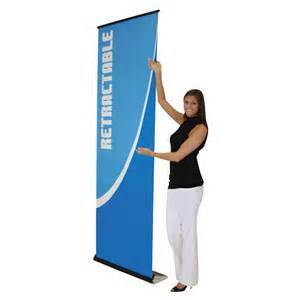 There are many different sizes of retractable banner stands. Other popular upright banner stand sizes include the 24″. 36″, 48″ and even a 60″ width stand. They are very popular because they allow for a backdrop image so that people can visually see what you are trying to project. Many times, people will place these retractable banner stands in a rowso that the total size of the image increase proportionately and much information or scenery can be seen. Since they are so easy to set up, it only takes 5 minutes or so to make a 10 ft display. 33″ x 78″ retractable banner stands are not very expensive. The cost is around$99.00, which includes design, print and stand. They come with a easy carrying travel bag and are self contained. Large format printers can do a remarkable job in bringing the design to life because of advances in print technology. In addition, a large format printer can take a 10ft or bigger design and print it out according to the dimensions of the retractable banner stand so that it appears to be just one design. To find retractable banner stands near you, simply do a Google or Yahoo search for sign or print shops near you and take advantage of this remarkable and powerful marketing tool to assist you in your business. Clark County Nevada Vinyl Banners For Businesses. Clark County Nevada vinyl banners are being used by successful companies to market their products in Clark County. Clark County businesses are placing their products on these banners and then displaying them inside and outside of their stores in order to create demand for their products. Clark County Nevada vinyl banners can be full color and include logos, pictures of products and other artwork to make the vinyl banner appealing to customers. These full color banners are then placed on visible areas so that customers can see them. Many Clark County businesses that are located near major streets or freeways are putting larger banners up on the outside of their buildings in order to draw the attention of passing motorists. Businesses are using websites like www.LasVegasLargeBanners.com to purchase their banners at incredibly low prices. Imagine a large vinyl banner 10ft x 20ft being attached to the outside of your business so thousands of passing motorists can see your banner. That is exactly what smart businesses are doing, especially ones that are adjacent to the freeways. There is a large furniture store at the 95 and 15 freeway intersection that advertises furniture with a large banner. this banner is changes out so that the merchandise they sell always appears to be changing to attract new customers. Best of all, these banners are so large as they act as a billboard but without the monthly rental fees associated with billboard rental. Clark County Nevada vinyl banners are not expensive. The average cost is about $2 a square foot. This price includes banner, design and grommets for easy hanging. Local sign shops in the Las Vegas area can assist you in making the perfect banner to help you market your products to your customers in a variety of bright colors. The large banners will create business for you. Table Front Vinyl Banners For Shows. Table front vinyl banners are being used by people attending trade shows and exhibits. When they have a table that faces the front of the exhibit with pamphlets and other sales material, people are placing banners on the front of the table to help identify what they are selling. Table front vinyl banners contain are taped to the front of a exhibition table and are usually 2 or 4ft in length and approximately 24″ in height. It is important to not have the table banner touch the floor. It is advisable to have the table banner be about 4″ from the bottom of the floor so that people who walk up to the table do not kick the banner or step on it. By allowing that 4″ height gap at the base, peoples feet naturally go underneath the banner and this will allow for a much longer banner life and also stop you from having to constantly readjust the banner after it has been pulled and tugged on. Table front vinyl banners can be any colors and contain pictures, logos, etc. These table vinyl banners are printed with large format printers that use state of the art inks to get the brightest and vivid colors. The cost of a 2ft x 6ft banner would be about $24.00 ( or about $2.00 a square foot) The price would include design time along with a finished print banner. The vinyl banners are usually made with 13 ounce banner material and inks that are designed for either outdoor or indoor use. To find table front vinyl banners near you, simply go online and search vinyl banners and an array of sign and print shops will be in the search results. Pick a sign or print shop near you that has the right equipment for your needs. Just let them know what size the table is, what you would like on your table front vinyl banner and they will be more than happy to assist you in your signage needs. Las Vegas strip signs are famous for their overall beauty and size. Many casinos on the Las Vegas strip have some of the most beautiful signage in the world. Las Vegas strip signs help attract the millions of tourists that come to Las Vegas to have a great vacation or work experience. Las Vegas is the entertainment capital of the world. Las Vegas boasts fine dining, world class hotel accommodations, entertainment, gambling, night life and many other amenities that make it a very popular tourist designation. Las Vegas is also the trade show and convention capital of the world, as more trade shows and conventions are held in Las Vegas than any other place in the world. Year round good weather also attracts many people to Las Vegas. When the weather gets a little hot, people head to one of the many luxurious hotel pools to cool off. As neon signs are being replaced with led digital signs in Las Vegas, the landscape is slowly changing. The led signs use far less electricity than the neon signage and costs far less to operate. While some old timers miss the signs with the neon and thousands of light bulbs that blink on and off, the younger generation seems to appreciate the quality that the led signs deliver. Las Vegas is also the sign capital of the world. As you can imagine, there are so many enormous signs because of all the casinos that are located in Las Vegas. There is a cluster of sign shops that work to keep these led and neon signs operating 24 hours a day. There is even a sign museum in Las Vegas that contains some of the older signs . Las Vegas strip signs are very fun to see and many people are just overwhelmed by the sight of these signs. 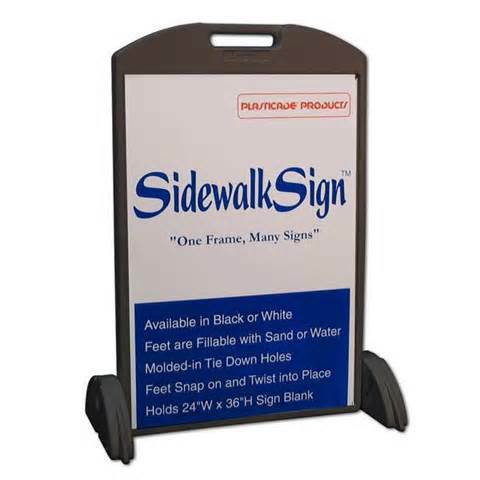 Signcade deluxe sidewalk signs are used by successful businesses to get their advertising out to the public. Sidewalk signs, also known as “A” frames, are a very easy and portable marketing solution to assist in advertising. Signcade deluxe sidewalk signs are common in areas where there is much foot traffic or car traffic. These sidewalk signs are placed near the roadways, in the roadway medians and near sidewalks to attract attention. They are very popular with restaurants to advertise daily lunch or breakfast specials since the sidewalk signs inserts can easily be changed out to reflect new food specials. Signcade deluxe sidewalk signs sets themselves apart from regular sidewalk signs by the innovative self retaining system the sign incorporates. The older sidewalk signs must have the coroplast insert tapes, screwed or fastened somehow to the sidewalk sign. The Signcade deluxe sidewalk sign allows for a self retaining system that holds the coroplast in place, which allows for easy changing out of the advertisement. The most common sizes of sidewalk signs are the ones that hold the 24″ x 36″ insert and the 18″ x 24″ insert. Both these models are big enough so that they can be seen by people walking or driving by. The Signcade deluxe model also allows for water or sand to be placed in the hollow plastic frame to weigh the sign down during windy conditions. The signs are light enough to be easily transported to a sidewalk and taken back at the end of the day. The signs come in many colors such as black, white, orange, yellow, etc. White seems to be the most popular color by business professionals. To find a Signcade deluxe sidewalk sign near you, simply do a online internet search for sidewalk signs and many search results will lead you to this cheap and effective method of advertising. Las Vegas banner printing is readily available in the Las Vegas area. 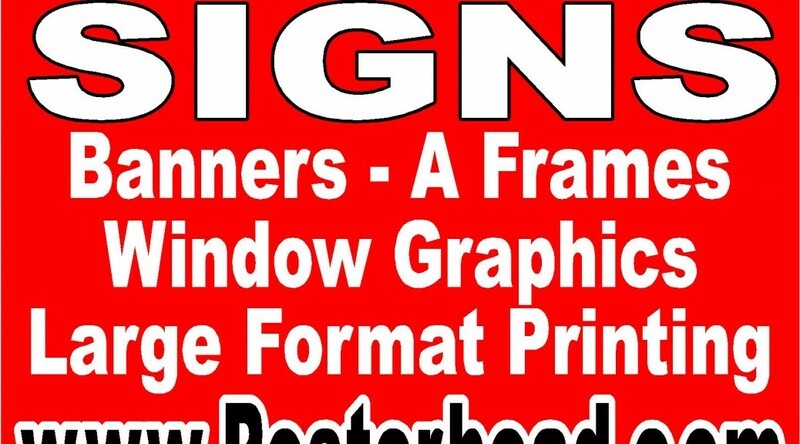 There are many sign shops that can assist you in obtaining the best banner at the best price. Las Vegas is the sign capital of the world. There are so many signs made in Las Vegas because of all the casinos and conventions held in Las Vegas. There are more trade shows and conventions in Las Vegas than any other place in the world. Consequently, there is a need for sign shops to accommodate the growing trade how industry. People love to have their trade shows and conventions in Las Vegas because of all the amenities that Las Vegas offers. With all the fine dining, world class entertainment and hotel accommodations, night life and other opportunities in Las Vegas, why would anyone want to have their trade shows and conventions anywhere else. Las Vegas banner printing is very inexpensive in Las Vegas. Vinyl banners can be printed in full color on 13 ounce banner material for about $2.00 a square foot. This price also includes design time and grommets for easy installation of the banner. Businesses like www.LasVegasLargeBanners.com can also make very large banners t a very affordable price. Most sign signs have large format printers that allow vinyl banners to be made very quickly and efficiently at an affordable rate. These large format printers can print a banner at an amazing speed with great quality. Logos and pictures are no problems for these large format printers. Las Vegas banner printing can be found by searching the internet for vinyl banner makers in Las Vegas. The sign shops in Las Vegas can make the vinyl banners on the same day when necessary. This quick turnaround will help people here on business for trade shows and conventions the opportunity to replace lost banners and signage.